To show its support for the government’s national housing agenda, LBS Bina Group Bhd (LBS) has teamed up with Perak State Secretary Incorporated (SSI) to jointly develop two parcels of land situated in the Temor and Chepor vicinities in Perak. Last week, the company’s subsidiary Bimbingan Simfoni Sdn Bhd signed a Memorandum of Understanding with SSI marking this collaborative effort, which was witnessed by Perak Mentri Besar Datuk Seri Ahmad Faizal Azumu at the Perak State Government office. Under the agreement, LBS will develop 50 acres of land located in Temoh, near Batang Padang district, and 41 acres in Chepor of the Hulu Kinta district. In combination, these two developments represent a gross development value (GDV) of RM200 million. According to LBS, these parcels of land are earmarked for mixed-use developments that will comprise cluster terrace homes targeting affordable price segment. In addition, the project will feature terraced houses as well as semi-dees. “Affordable housing is the key issue for the nation now. 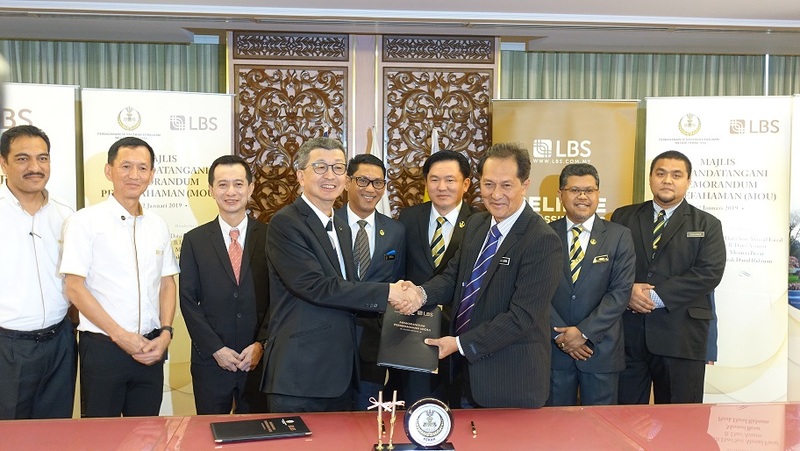 The collaboration between LBS and SSI stems from the shared passion to help realise the Government’s commitment in delivering one million affordable homes over the next 10 years,” LBS group managing director Tan Sri Lim Hock San said at the signing ceremony. Tan Sri Lim Hock San, exchanging the MoU document with Perak State Secretary Incorporated chief executive officer Azizul Rahman while their respective teams look on. “We sincerely thank the Perak State Government for placing their trust in LBS. We are committed to delivering homes that cater to the needs of the people in Perak specifically meeting the affordability criteria,” he added. LBS has over 25 years of experience in developing innovative projects that are aimed at meeting the needs modern home buyers and communities. To date, the developer has delivered 35,000 properties, including affordable homes, high-rise apartments, integrated townships and commercial units. It achieved RM1.53 billion sales last year, recording its fourth consecutive year of growth. Lim said that the upcoming projects would feature the signature qualities of other LBS developments – quality homes that promote a balanced lifestyle. “In this day and age, building homes has gone beyond constructing a house with a roof. We need to put ourselves in the shoes of our homebuyers, studying their needs and lifestyle in order to create homes that will improve their lifestyles,” he said. Also speaking at the MoU signing, SSI chief executive officer Azizul Rahman Mohamad said the affordable housing sector has been listed as one of the priority sectors in the Perak state government’s plans for 2019. “We are targeting to build 50,000 affordable homes in Perak within the next five years. This partnership with LBS is aligned to the state government’s mission to help more people from the low to middle income group to own a home,” he said. Construction works is expected to begin in the fourth quarter of this year and it is targeted for completion over the next three to four years. Tan Sri Lim Hock San, exchanging the MoU document with Perak State Secretary Incorporated (SSI) Chief Executive Officer, En Azizul Rahman.